This original lithograph, La Femme au Fauteuil, 16.2.1947 (Woman in the Armchair) was created February 16, 1947 and so dated in the lithographic stone. The original lithograph was created in 6 colors and, interestingly enough, Picasso wrote out those colors in words at the bottom of the lithograph: "vert Rouge bleu violet, jaune (super scribed 'violet'), noir". It was printed on Arches paper and signed by Picasso in red crayon. Picasso created various proofs of this image adding colors successively until the image as shown here was created. This lithograph is one of his most significant experiments in using color in printmaking. This image was created in an edition of 50, of which this one is numbered 31. In late 1948 and early 1949 Picasso created a series of lithographs for which this image was the basis. When Picasso created this lithograph at age 65, it was the most colorful lithograph he created to date. 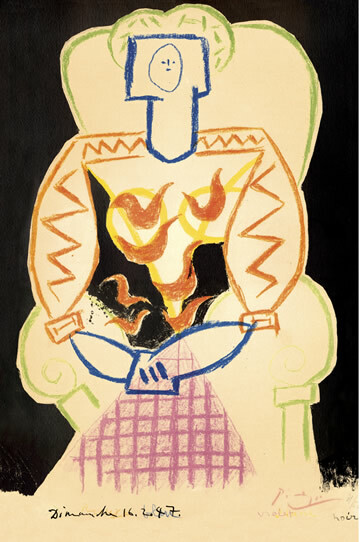 There are very few examples of any Picasso lithographs in more than 6 colors. On May 15, 1947 Picasso's child with Françoise, Claude, was born. In August Picasso visited the Madoura pottery workshop in Vallauris where he began to make some 2,000 ceramic pieces over the next year. Also during the fall Picasso began working on his play Les quatre petites filles which he finished August 13, 1948.